Spending Stories draws comparisons between amounts of money, giving users a context in which to understand how money is being spent. Spending Stories, which officially launched Thursday, is a new way to put spending figures in their proper perspective. Developed by the Open Knowledge Foundation and Journalism++ with funding from the Knight Foundation, Spending Stories is an app that helps citizens and journalists understand and compare monetary amounts in stories from the news. When we hear that the UK’s school meals program costs £6 million, what does that really mean? It means, for one thing, that it costs about a fifth of the annual spending on the monarchy. "When we hear that the UK’s school meals program costs £5 million, what does that really mean? It means, for one thing, that it costs about a fifth of the annual spending on the monarchy." Spending Stories draws out comparisons between amounts of money, giving users a context in which to understand how money is being spent across society while referencing the original news stories. 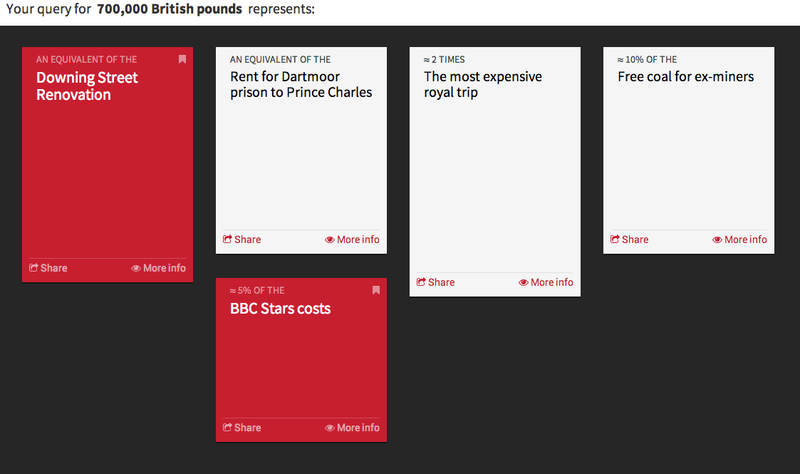 Users can enter a figure into Spending Stories and get a scale visualization showing how it compares with spending stories from the app’s database. The app displays the big picture, and users can then click through to a card visualization that shows how the amount relates to specific stories. 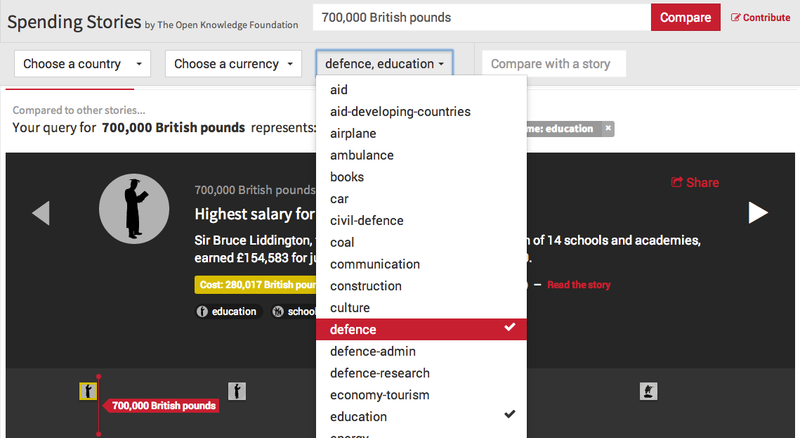 Users can filter stories to only show amounts that relate to the user’s interests, for example aid or energy. 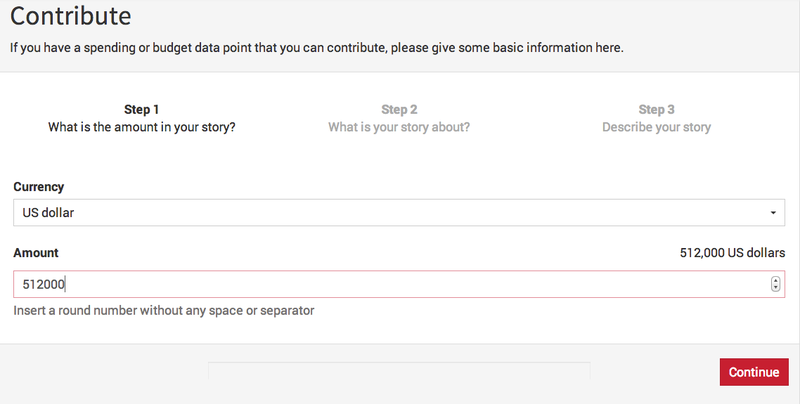 If users find news stories of interest they can contribute these to the database in three easy steps and share them. Due to the good availability of UK spending data in OpenSpending, this first release of Spending Stories focuses on the UK. Spending Stories is, however, an open source project and can easily be forked and translated into other languages. We hope to help Spending Stories sites launch on their own and expand with new features and local news stories. At launch, we can already confirm that Open Knowledge Foundation Japan will deploy a Japanese version of Spending Stories with news stories from Japan. If you would like to know more about the options for installing a local Spending Stories site, get in touch. Neil Ashton writes documentation and web content to help the Open Knowledge Foundation’s projects reach a wider audience.